Since this is CoHo, I knew there’d be major feels involved in reading this book, and as anxious as I was to get my hands on it, my life was a little chaotic when it was released. I’m glad I waited until I had time to savor this story to start it. Without Merit falls more in the It Ends With Us category of CoHo’s books in the sense that, yes, the romance is still there, but the story is about more than just the main character finding someone to love. It’s still full of drama, angst and imperfect characters, which, for me, are the true marks of anything this author writes, but it’s a little darker, like CoHo’s last book. Having said that, It Ends With Us is still a much better book than Without Merit. It doesn’t mean that WM isn’t really good (see the 4 stars above), but It Ends With Us was fantastic! That book is on a league of its own, as far as I’m concerned. Now, CoHo’s new story grabbed my attention from page one. I immediately connected with Merit and the fact that she was different. A little odd, really smart in a non-conventional way, and there was something about her that I couldn’t pinpoint until much later on that spoke to me. As the story evolved and I got a better understanding of who she was and what she was going through, I ended up seeing a little of my teen-self in Merit, and that was what made this book extra special for me. The portrayal of depression in this story hit me right at the feels because it felt authentic and familiar. Depression is so complex and it manifests in so many different ways, and while some may not identify with the way it was shown here, others like me will. For me, Merit’s experience was probably the closest to my own in all books I’ve read so far, so my love for this girl and for the way she handled herself throughout this book comes at no surprise. I also thought the book had a lot of contradicting ideas. One moment a character was saying something and a few pages later they said the complete opposite. WTF? There was also a lot of info-dump in the first few chapters, which, being familiar with CoHo’s writing style, surprised me. But CoHo’s writing kept that addictive quality, which means I pushed through the info-dump segments and, looking back now, I can see the importance of the information given in the beginning. We needed it to understand Merit and her family better. I still wish it’d been given in a different, more dynamic way, though. 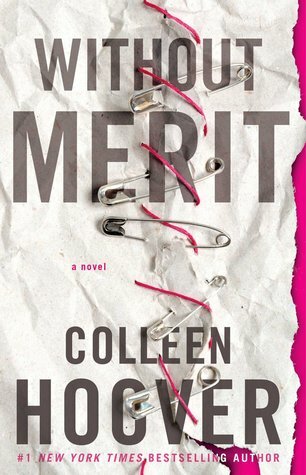 All that aside, Without Merit was, as all CoHo’s books I’ve read so far, a story about complex characters. And damn if the Voss family wasn’t that and more. From Merit’s obsession with trophies, to the triangle between her mom, dad and stepmother, to the fact that they lived in a building that used to be a church, everything was over the top in a way that simply worked. I caught myself thinking “How can so many troubled people be part of the same family?” and “How can Merit be so unlucky?” over and over, but somehow it all worked. It worked because it evoked feelings. I laughed, then my heart broke for Merit, then I fell in love with how mature Sagan was at times, and fanned myself during the kissing and making out scenes, then teared up with Wolfgang, and gasped when family secrets were revealed, and teared up again when siblings forgave each other, and laughed and swooned a little more. But, really, there’s no surprise there. This is one of the reasons I love CoHo so much. She always takes me on a roller coaster ride.